More and more customers are choosing Ceph as the open and unified storage solution for their OpenStack based IaaS platforms. One of the key advantages that Ceph offers is both object storage (e.g. dropbox, google drive) and block storage (e.g. luns, drives) from a single interface. In theory this reduces the number of products that a customer needs to manage and train their staff on. Limitations worth noting are a current lack of production grade asynchronous replication if attempting to span Ceph across large distances. The object storage also lacks many features currently available with dedicated products such as Swift, so be sure that the business requirements are clearly identified. All that said, if multi-region isn’t required and security is not a primary concern then Ceph is a very performant storage solution. 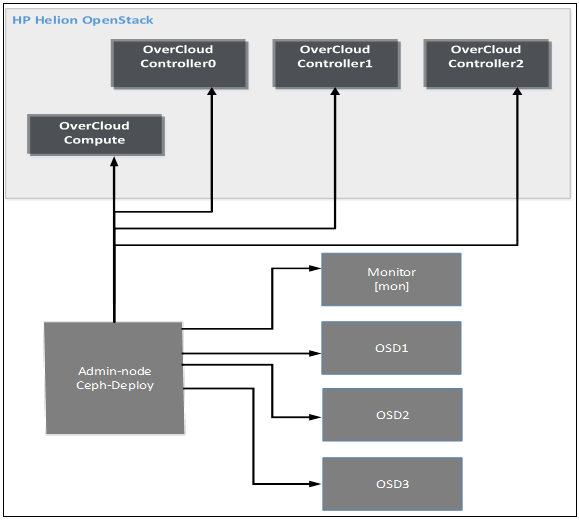 Modify /server/server.json to include OpenStack credentials from the Undercloud (stackrc), network, and the keypair from Helion OpenStack. This file configures the undercloud flavors for the physical Ceph nodes. As with the bare metal file in the previous HOS section this file is used to define the characteristics of the physical nodes that will be integrated using the installer. Defines environment variables for installation. secretuuid:     123456789123456789123456789           # This the UUID that will be used to setup the helion nodes. Change this prio to running the ceph-client and ceph-admin roles, if you wish to newly generated UUID. The same UUID will work too.